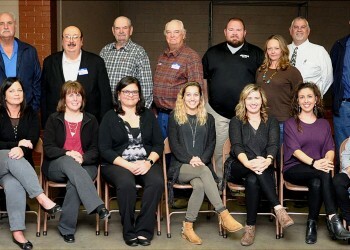 The Harper County Community Foundation recently recognized the grant recipients for the October 2017 round at an Awards Presentation held in conjunction with their End of the Year Gala. The event was held at 7 p.m., on Tuesday, October 24th, in the Memorial Building in Attica. These monies from the Waste Connection Landfill Revenues and the Harper County Board of Commissioners represent the eighteenth round of grants awarded. The Foundation also awarded monies from their discretionary funds. For this grant round, 49 grant applications were submitted to HCCF with a total of $249,321.50 requested. The Foundation awarded $110,000 to 29 organizations and projects that benefit Harper County. Recipients of the October 2017 grant monies are Harper County Transition to Career for Luncheons; The Arts Center for Roof Replacement; Anthony Chamber of Commerce’s 21st Sunflower Balloon Fest; VFW Post 11449 for Meeting Room Restoration; Warrior Football for Uniform Purchase; Ministerial Association of Anthony for the Anthony Food Bank; Harper Recreation Commission for Complex Maintenance Equipment Upgrade; Anthony Christian Church for Community Youth Group Meals; City of Attica for the I Like Me Drug Free Program and City Pool Updates; Harper County KSU Research and Extension for Life Skills Education; Anthony Medical Center for the Maintaining Stability of Laboratory Materials and Patient Specimens Project; Attica Public Schools for the School Nurse’s Medical Needs Project, Art Department Modernization, JH & HS Accelerated Reader Rewards and Vocational Arts Shop Update; Anthony Recreation for Sports Equipment Replacement; City of Danville for Lighting of the American Flag at the City Building; Harper United Methodist Church and Pleasant Valley Mennonite Church’s Wednesday Night KMotion Program; Harper Elementary School for Summer Express Workbooks and Dramatic Play for Kinder Play; Anthony Gun Club’s Shells Purchase for Trapshooting Team; Harper Hospital District #5 for Clinic and Surgical Needs; Historical Museum of Anthony for a Heating and Air Conditioning Project; Attica Recreation for Attica Baseball Field Renovations; Harper Mission Mart, Crossroads Family Resource Center for Educational Programming, Anthony Elementary School FOCUS for Educational Field Trips and Harper County Community HOPE. HCCF’s Mission is focused on education, human needs, health care, community improvement or rural development projects that will enrich the communities of Harper County through support and resources. The deadline for the next grant round will be May 1, 2018. Front Row: Angie Alexander, Attica Recreation; Jamie Deviney, City of Attica; Jana Scripsick, Attica USD 511 School Nurse; Sandra Owen, Harper Hospital District #5; Katie Calvillo, Anthony Medical Center; Christy Reel, Harper County KSU Research and Extension; Mindy Westenhaver, Crossroads Family Resource Center & Anthony Elementary School FOCUS; Kasha Moritz, KMotion; Kathy Francis, Historical Museum of Anthony; Juliana Whisman, The Arts Center and Karen Younce, Anthony Chamber of Commerce. Back Row: Kevin Alexander, HCCF Executive Director; Mark Aldritt, Harper Mission Mart; Mike Campbell, Attica USD 511 Visual Arts; Paul Saliger, VFW Post 11449 of Harper; Warren Stanton, Ministerial Association of Anthony; Danny Porter, City of Attica; Sid Burkholder, Anthony Gun Club; Jason Fahring, Attica USD 511 Vocational Arts; Jennifer Foley, Harper County Community HOPE; Chuck Keller, USD 511 Superintendent; Josh Swartz, USD 361 Superintendent and Maxine Olivier, City of Danville.